This day we visited midorigaoka elementary school. In most elementary schools we visited, the kids were all looking forward to interact with us, but this school was slightly different. This school had been in the World Campus – Japan program for several years in a row now and the connection with World Campus International and some of its members was seemingly deeper. 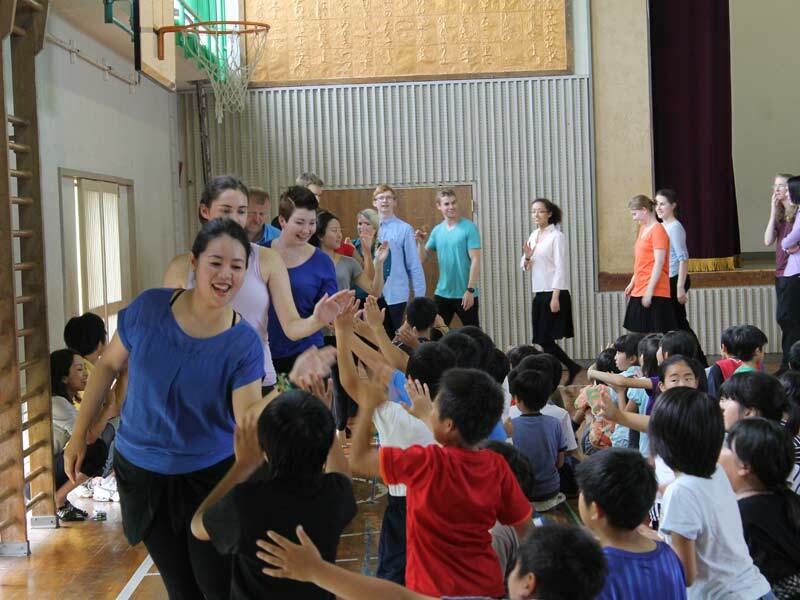 Many kids who had experienced the cultural exchange a year before had already been looking forward to the return of World Campus – Japan since that same year. They were extremely happy to see us and came to see who we are as soon as we entered the building. We set up our World Campus – Japan headquarters in the library where we split up into four groups and all went to our pre-scheduled class rooms. The first class me and my group joined was a first-years class. Because the first years students didn’t speak any English we interacted through music. We sang and danced with the kids and a lot of fun! We then moved on to the next class, where the students did speak some English. We all introduced ourselves and all the kids also introduced themselves. We then had a question and answer session so we could get to know each other better. After the classes it was time for a school lunch. We all picked up our lunches in the headquarters and the students came to pick us up and took us to their class rooms to eat with them. I went to the special needs education class in the school for lunch. This class consisted of three students, one teacher and one helper. The teacher used to be an English teacher before and thus the conversations we had went smoothly. We talked about the kids and what their hobbies were. Each of the kids showed us what they liked to do. One of the kids was extremely good at drawing and showed us a drawing he made of two kids playing outside. It had a lot of detail and was very realistic. If I had guessed who had made the picture, I would have guessed somebody who had been studying art or design, but no, this ten year old boy whose passion was to draw, drew this in his play time while all the other kids were out playing soccer or dodge ball. After lunch everybody of World Campus – Japan, all students and all teacher gathered in the gymnasium. The students officially welcomed us to their school and we thanked them for welcoming us. As a thank you we performed several Japanese dances on stage and played games with them afterwards. The children knew many of the songs we performed and sang, danced and clapped with us and the music! They had a lot of fun. Even the teachers seemed to enjoy it and some of them even joined us when playing the games! We all had a great time here! After the music event all World Campus – Japan members went back to headquarters and it was time for the kids to go home. Even though it was time to go home, many kids decided to stay a bit longer and say one last good bye to us while asking for our signature. After that they went home probably awaiting our next return. I hope that world campus international will get another chance to have this great experience again next year!